For years, acetaminophen has been widely used and considered safe for lowering fever and relieving aches and pains. Advertised as the pain reliever most recommended by doctors, Tylenol is typically found in every medicine cabinet. However, people need to be aware of the serious risks associated with taking too much acetaminophen (which is the active ingredient in Tylenol). Recent FDA warnings have been published in an attempt to cut down on incidences of potentially fatal liver damage associated with acetaminophen. In January of this year, the Food and Drug Administration (FDA) urged healthcare providers to stop prescribing combination drugs products that contain more than 325 mg of acetaminophen, due to the potential for serious liver damage. What is a Combination Drug Product? So, the overall problem is that numerous OTC medicines and prescription painkillers contain acetaminophen in varying strengths. According to statistics, 7 in 10 Americans use OTC medicines to treat cold, cough and flu symptoms—not to mention using them as sleep aids. 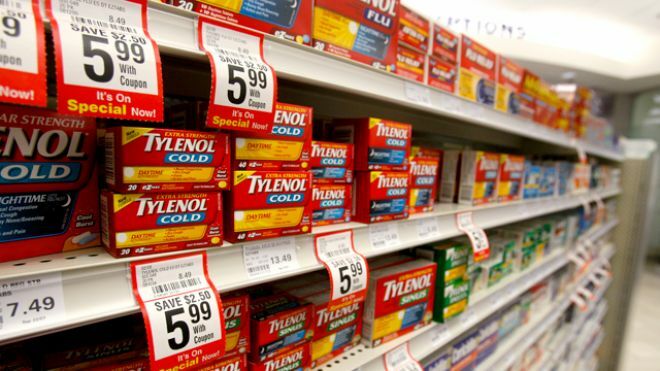 DayQuil, Tylenol Cold and Flu, Tylenol PM and other multi-purpose cold remedies are on every store shelf. People who are looking for relief from a cold or the flu may not know that acetaminophen comes in combination with these other medications. The FDA got involved because there are more than 600 medicines on the market that contain this popular and powerful painkiller, and it is the leading cause of acute liver failure in the U.S. According to the FDA, “your risk of liver damage goes up if you take a medicine that contains acetaminophen to treat a headache—and while that medicine is still active, you take another medicine that contains acetaminophen to treat a cold.” Currently, the safe 24-hour dose limit of acetaminophen is set at 4,000 mg (for adults), but some experts say that it should only be 3,250 per day. Doctors may prescribe extra strength doses of painkillers containing acetaminophen, yet some consumers still reach for over-the-counter remedies. Doses of acetaminophen can contain as much as 1,000 mg, so it can be easy to over-shoot the 4,000 mg mark. Bottom line: If you’re taking more than one medicine at a time, you may be inadvertently putting yourself at risk for liver damage due to overusing acetaminophen. Tylenol and other acetaminophen-containing combination drugs kill hundreds of people and send about 56,000 more to the hospital. As it turns out, liver damage isn’t the only side effect from taking too much acetaminophen. The FDA warns that acetaminophen may also be linked to rare but serious skin reactions.The FDA says anyone taking acetaminophen that develops a rash or other skin reaction should stop taking the product immediately and seek medical attention right away. Dr. Sharon Hertz, a spokesperson for the FDA says: “This new information is not intended to worry consumers or health care professionals, nor is it meant to encourage them to choose other medications.” Because this warning is new, labels on some products bought over the counter will presently make no mention of the serious potential adverse skin effects of acetaminophen. The FDA is now working with pharmaceutical firms to update the labeling. Meanwhile, the regulator is already requiring that all prescriptions for the drug mention the new safety information. As a Patient Healthcare Advocate, I review all of my client’s prescriptions and daily medication routines. I can answer questions about drug interactions, dosage information and safety when using prescription or over-the-counter medication. If you or a loved one has questions or needs help with medication, feel free to contact me via email or telephone!